Pulp | Fieldwork Brewing Co.
A: Pours super hazy pale golden yellow with a frothy off white head that settles to a thin layer and leaves a little light lacing. S: Massive juicy citrus runs the show, backed with a little tropical fruit, a bit resinous, biscuity malt, and caramel sweetness. T: Big bright juicy citrus, orange, ripe grapefruit and lemon, accents of tropical fruit, pineapple, peach, apricot, and a little passion fruit, slight resinous almost piney quality, biscuity malt, and caramel sweetness. M: Medium body, moderate carbonation, soft on the palate, with a touch of hop burn. O: Absolute citrus bomb. They pulled a ton of great stuff out of those citra hops. My only slight gripe is it feels a bit 1 dimensional, but they nailed what they we're going for. Subdued nose on this one so had to search a bit for the aromatics. Whiffs of tropical citrus hoppiness when found. This has a very smooth taste and finish with very low bitterness. That makes this IPA so crushable! Pours very hazy & cloudy yellow orange, small white head, decent retention, good amount of solid lacing. Zesty aroma primarily of citrus fruits, pulp, and peel with some peaches and tropical fruits. Great blend. Taste follows, super juicy with fruity yeast notes complementing all the fruity hop flavors. Feel is medium, smooth & creamy, low bitterness, lively zesty finish. Overall, terrific hazy. Feel like it's much better than the batch I had about a year ago. Right there with the best of the West. Definitely one of the best Fieldwork has brought to the table....this rivals some of the best NE IPA'S out there. A delicious hazy juicebomb that never disapponts! Like getting straight citra juice, almost as if I was drinking a glass of OJ. Pours golden with a one finger white head. Nice lacing. Aroma floral notes and dank. Taste follows the nose with pineapple, peach flesh and big lemon zest finish. First one from Fieldworks. Look forward to more from them. 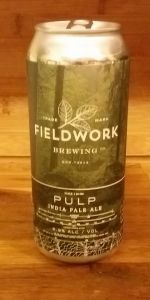 Pulp from Fieldwork Brewing Co.